New application architectures like microservices and containers will drive new network architectures to enable automation. Just as digital transformation means more than apps and gadgets for the business, it also means more than automation within IT. Yes, organizations are changing the way they deploy apps -- using automation and orchestration -- because of digital transformation initiatives. But they’re also changing how they develop apps, and that means more than just adopting agile. You might recall that in F5’s State of Application Delivery 2018 report in addition to agile and automation, 41% of organizations were also exploring new architectures like microservices and new environments like containers. That, in turn, will have a profound impact on the way IT deploys applications which will, more than likely, require new network architectures as well. This is not new. Since the mid-1990s when architectures shifted dramatically to client-server, and then around 2005 when we saw web applications rise with Web 2.0, application architectures have driven significant shifts in network architectures. We are seeing that again, now, with the rise of containers and cloud. Both assume that the app truly is the center of the universe, which of course is the network. What cloud began, containers are going to cement into the network: An architectural shift that forces networking away from a shared pipe model to one that embraces a per-application model. That can mean cloud, or clusters of containers. It likely will mean both. The result is important to your business, but the point of this column is not to tell you what your network is going to look like in 2020; it’s to point out that it won’t look the same. Because digital transformation isn’t just about more apps, and more gadgets, and more APIs. All of that is the external face of digital transformation. Inside, it’s about automation and architectures. Too often we focus on the former and forget the latter, when the latter is just as important (maybe more) to get automation right. As pressure from both sides of IT – development and delivery – mount, there is increasing need to adopt new models for the services that ensure the secure, scale, and speed of the applications driving the digital economy. Those application services are things like load balancing, caching and compression, web application firewalls, and increasingly, bot protection. These services need to be consumed in the same model in which apps are being delivered. That means as a service and in containers. Your network is going to look different because it’s going to have to operate differently. You won’t be able to scale the network and all its services simply by upgrading bandwidth and increasing port density. You’re going to have to scale like software scales: up and out. A combination of hardware, software, and cloud services will be needed to finish that Visio network diagram. Your network is going to have to support a multi-generational mix of application infrastructure and architectures. That means it is going to be virtualized, software-defined, and containerized, all at the same time. 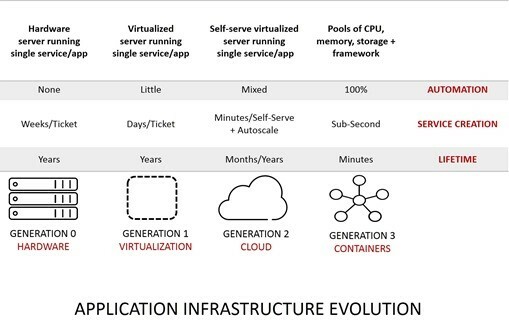 A single application service might exist in the network in a variety of form factors: Hardware at the edge, virtual in the private and public cloud, and containerized deep inside. Architectural parity in the network with that of application architectures is a key component to getting multi-cloud and modern, per-app architectures right. Matching form factors is imperative to ensuring that security and scale moves with the application into its new environs, even if that environment is a new network segment dedicated to cloud or containers – or both. Automation isn’t the only piece of the network transformation puzzle. Architectures will be as critical a component in successfully realizing an agile network as automation, maybe even the most critical. Hear more from Lori MacVittie live and in person at Interop ITX. Attend the Network Transformation Summit at Interop ITX, April 30-May 4, 2018. Register now!